Founded in 2014, The SEED School Miami is the only public, college preparatory boarding school in South Florida. Their mission is a seemingly simple one: provide a rigorous education that empowers students to be academically and socially successful in college and life. 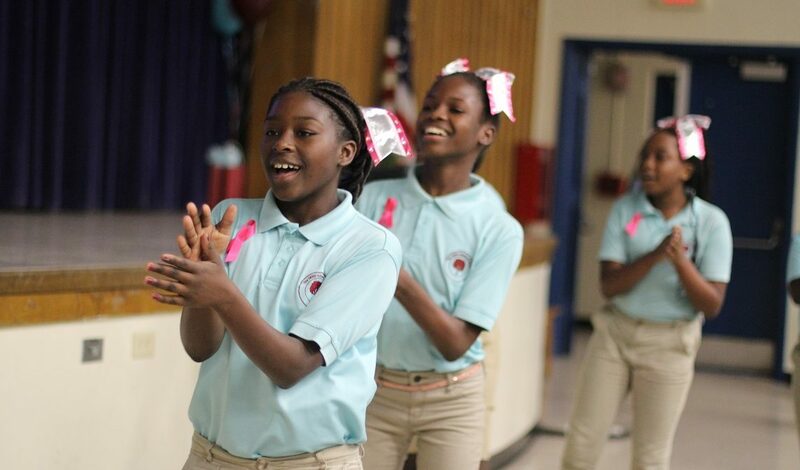 Beyond the rigorous academics, what helps students bloom is SEED’s Sparks program, says Tiffany Graver-Smith, director of development for The SEED School and a 2018-2019 Miami Leader. We chatted with Tiffany and visited the school to learn what makes SEED different and how they ignite a passion for learning, inside and outside the classroom. What makes The SEED School different from other public schools? SEED attracts a diverse population of students from across South Florida. They check into their dorm rooms on Sunday afternoon and stay through Friday night. When on campus, they benefit from a 24-hour boarding school environment. Here, they gain the knowledge and tools to shape their future – and their community. Your school’s Sparks program is a special part of student life. Tell us more about how it helps create a learning environment. SEED knows that a student’s “spark” is a vital part of who they are and how they look at the world around them. We think of “sparks” as “the talents, hobbies, and interests of young people.” Sparks activities, supported by Community Grants, are designed to help them reach their academic and life goals. Students have the opportunity to tap into their passions, from visual and performing arts to technology clubs, mock trial and athletics, and connect with peers and caring adults. It seems students’ passions have flourished thanks to the program. What does that look like for students and how has SEED channeled that growth? SEED Sparks have led scholars to become finalists in the Independent School Athletic League championship basketball game and participate in a spoken-word competition. Students also had the chance to ride horses at a ranch and attend the eMerge Americas technology conference. We also host a Sparks Showcase, funded in part thanks to Give Miami Day donations, and talent shows throughout the academic year. The spring show includes all students, staff and family members – it’s a full house! Last year, students in the dance Spark and those who participate in The Bulldog Theater Jr. shared their talents and performed scenes from “High School Musical” and “The Wiz.” The Joyful Sound of SEED, the school choir, also amazed the audience with their rendition of “Plant A SEED,” the school song. Can you share an example of how participating in Sparks helped make a difference in a student’s life? What’s next for The SEED School? SEED opened its doors with 30 girls and 30 boys, all sixth graders, on the campus of Florida Memorial University. Today, the school serves 300 girls and boys in sixth through 10th grades. The plan is that by 2020, SEED will enroll 400 students, taking them through 12th grade, and graduate its first class. A new campus and dormitories are also in the works. Applications for the 2019 Community Grants cycle are now open. Pre-proposals are due by February 11th. For questions, please contact Jordan De Leon, programs associate.